Wadlow point, Airport site, Sangamon County. 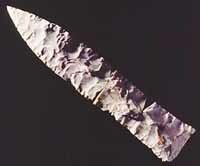 This 4,000 year-old Late Archaic knife is typical of those found in central and southwestern, Illinois. It was made from chert, a silica-rich rock that can be shaped by slowly chipping away unwanted material. Chert is found in limestone bluffs along the lower part of the Illinois River valley and other locations in the state. The Ice Age came to an end quickly in Illinois. Warmer climate encouraged the growth of new plants. Deciduous trees replaced spruce and pine, which continued to grow in more northerly latitudes. Animals also changed their way of life, because most animals depend on plants for food. Ice-Age mammals such as the mastodon became extinct, due, in part probably, to changes in the availability of food. They were unable to adjust to the new environment. Other animals moved to habitats with familiar plant foods, some ending up hundreds of miles from Illinois. Animals accustomed to deciduous forests became more common in Illinois. With all of these changes, Paleo-Indian people also had to change their way of life to survive in this new world. Archaeologists identify this new way of life as the Archaic period of Native American culture. This period began about 10,000 years ago and lasted until 3,000 years ago. It is divided into three sub-periods: Early (10,000 to 8,000 years ago), Middle (8,000 to 5,000 years ago), and Late Archaic (5,000 to 3,000 years ago). Each sub-period represents a similar, but slightly different way of life. Early Archaic spear points from west-central, Illinois. 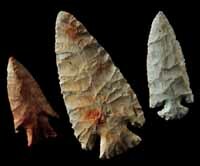 Archaeologists often use the shape of spear points to identify their age. These three points, all of which are more than 8,000 years old, are typical of the Early Archaic period. They were used to kill and butcher animals like the white-tailed deer (Odocoileus virginianus). The Archaic period was a time of change. Early Archaic people in Illinois continued a hunting and gathering way of life, but they invented new tools to do so. Middle Archaic people were less nomadic. For at least part of the year, they lived in villages. Late Archaic people still hunted and gathered, but they also cultivated native plants to supplement their food supply. You have to dig deep into the past to find out how and why the Archaic way of life developed.